This syrup's delightful sweetness, traditional taste, and smooth consistency makes it a deliciously-indulgent accompaniment to a variety of breakfast services. The 1 gallon capacity will keep you in good supply of this sweet, sugar free topping. Plus, the easy-pour opening allows this syrup to be easily transferred to a smaller, sophisticated container or syrup dispenser for use at individual tables. In addition, this bottle features a resealable cap to keep the product fresh and flavorful until it's gone. The cap also helps to keep the syrup from spilling out if the bottle is accidentally knocked over, therefore preventing unwanted messes. 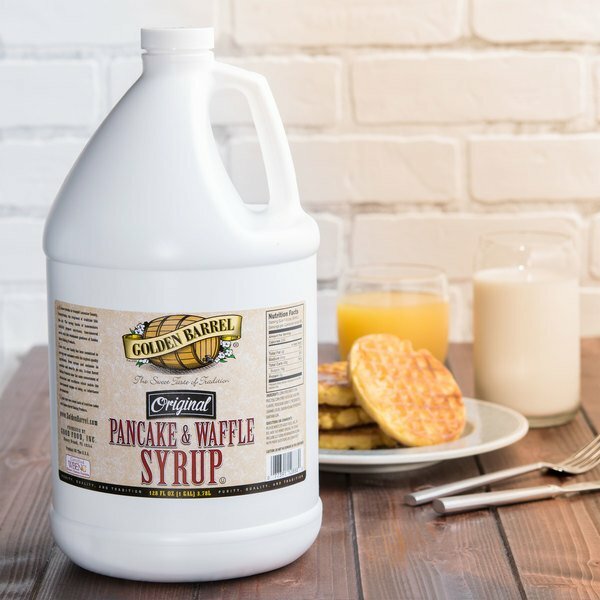 Ideal for diners, restaurants, hotels, and more, this Golden Barrel 1 gallon pancake and waffle syrup is perfect for adding a smooth, sweet flavor to your most popular breakfast offerings. Hands down the best tasting syrup in this price range. This product will stand up against some of the ultra premium syrups all day and about half the cost. Recommended to everyone I know in the business. 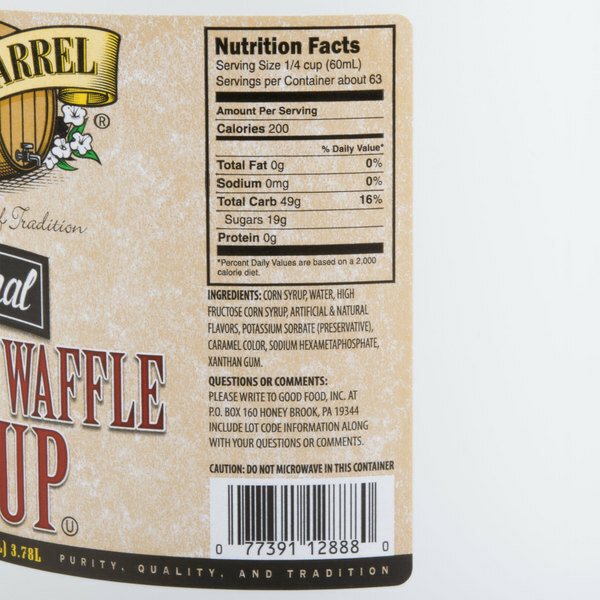 Great taste, thinkness, and quality with this value priced syrup. We use this with all our waffle orders and its a hit people love it. Our customers are always complimenting and asking what pancake syrup we use. We always let them know it is from Webstraunt. You make ordering easy and the product is wonderful. Golden barrel anything is going to be good. This syrup is absolutely delicious. This is now the only syrup that we use in our businesses. A really nice gallon size container of pancake syrup that is great for our warmer machine. The syrup warms up nicely for easy pouring and tastes great. Delicious! I ordered this syrup for a Wing Fling where we were serving Waffles and Chicken. Glad I ordered it! It tastes delicious! The guests loved it! I would definitely order again. 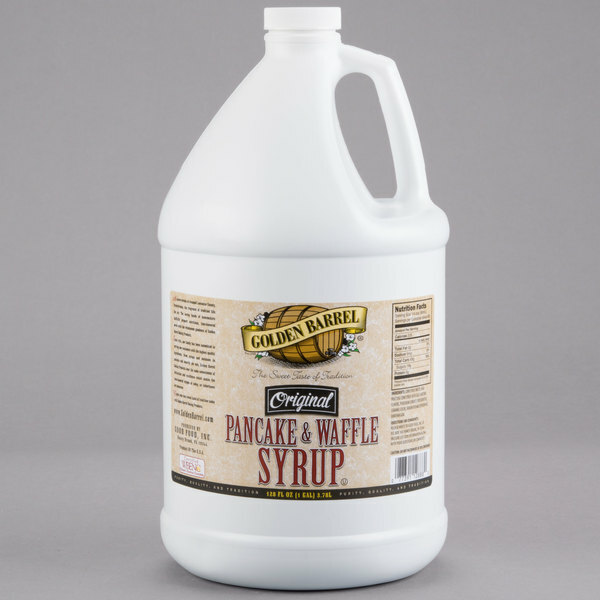 The perfect gallon size container of syrup that is great for dispenser use. It is great for breakfast buffets and brunches. A great tasting syrup as well. We love this syrup for its taste and price. We order some every time we have pancake night fundraisers. The syrup taste great and is perfect for putting into smaller squeeze bottles. I love this syrup! My roommates and I have "breakfast for dinner" nights and this is a big staple, so having it in bulk makes it easy to have whenever we feel like it! The syrup is sweet and rich in flavor, but not too sweet. This syrup tastes so good. We use it right along other fancier more expensive syrups. This product fully exceeds our expectations and we couldn't ask for a better price! This is a solid tasting syrup for the price. Its great consistency for pancakes and other breakfast items. You will want a different serving container but thats pretty expected when buying in this quantity. This syrup is as good as any of the imitation syrups that i've tried. We switched over several months ago and never heard a peep from our customers. The taste is good and the price is right! decent syrup, definitely look into smaller container since this is a good sized bottle for little hands to try to maneuver, after the first major spill we solved that issue. Love this syrup for my waffles that I sell. Customers love it too. Great price you really can't go wrong with this size and price. A good syrup we first purchased this with the addition of serving breakfast in our place, this container goes a long way and the taste is good. I was hesitant to buy this product online. I must say how impressed I am with the quality. This syrup has a wonderful flavor and can be compared to any high end syrup. We use it only for waffles and our customers love it. We only use this syrup at our catering company, all our guest at all of the different types of events we do love this syrup. Great product. We have always served Mrs Butterworths syrup. We switched to Golden Barrel, at a considerable savings. We have been asked, what kind of syrup is this? It's the best syrup, I've ever had. Excellent price for a great product. It was shipped quickly and safely and my customers love the quality. We use it for Belgian Waffles and I plan to continue ordering this product. Golden Barrel syrup has a very good flavor. I think it will stand up to the most exspensive. Customers like it. I order it all the time.